Wonderfully versatile, the Madison collection is a set of top quality towels that are perfect for every home. When you step out of the shower you want to keep that toasty warm feeling for just a bit longer. That’s why we’ve made these towels gloriously thick and soft, so you can snuggle up as you dry off. Keep that winter chill at bay for just a bit longer! 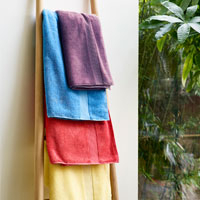 Whilst certainly feeling plush, these towels are lightweight enough for regular everyday use. With additional ribbed detailing, the Madison towels look incredibly stylish and can add that extra touch of sophistication to any bathroom. Browse this high quality towel collection below. Boasting a 560gsm this towel is ideal for family use. Made from 100% combed cotton it has the necessary strength to retain its high quality for years to come. This durability is the remarkable result of the combing process which removes all but the strongest, longest fibres. 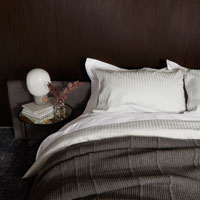 As well as producing a stronger cotton, this process also gives a far softer, more luxurious feel. The three flat decorative bars introduce an interesting new texture to the towel whilst also creating a more distinctive aesthetic. 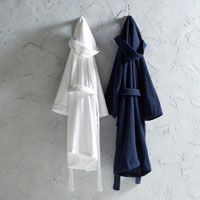 We recommend pairing these towels with the Christy Bath Rug which features a similar linear design.